John Williams has a reputation for generosity. It comes up frequently in conversations with people who know him. I hear it several times in the days leading up to this interview. I have been sitting in his conference room in Atlanta, Georgia, which he uses as his office, for less than five minutes when he asks if I’d like a “Ranger book”. It’s nice and glossy, filled with photographs of the 41.55 metre magnificent modern J Class named Ranger. I have seen it before but don’t own a copy, I tell him. A hardbound volume with the largest J Class yacht ever built gracing its slick jacket is delivered in minutes and he proceeds to sign his name on the inside cover in his meticulous handwriting. He slides the book on the sleek mahogany tabletop toward me. “Thank you, Mr Williams,” I say. “Call me John,” he replies. In spite of the title of this feature, I am not, sadly, on board Ranger, the yacht he built in the early 2000s in Denmark. She is currently in Newport, Rhode Island, where Dan Jackson, the fleet manager whom Williams calls “the admiral”, and Ranger’s long-time crew, have recently tested a few new tricks added to her panoply. 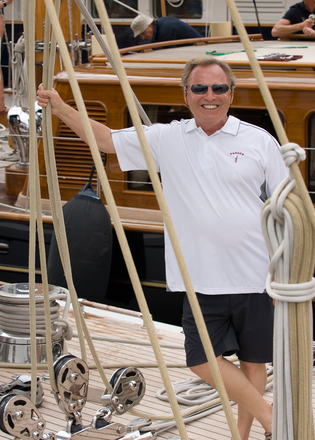 In July, they took part in the Candy Store Cup, the race that replaced the Newport Bucket, just to stretch their sea legs. They’re fine-tuning some of the improvements they’ve made recently, seeking to gain “one-hundredth of a knot”, he says. He was in Nantucket a few weeks before to check on the tweaks that have been made to Ranger and treated his guests and crew to a dinner of tomatoes and burrata, lobster diavolo and bananas foster. He likes to prepare dinner while listening to rock and roll music. “I like to cook, stir and dance,” he says. I soon find out that he has a great sense of humour. Among the many plaques and commendations on his office wall is what looks like a movie poster of Gladiator, only John Williams is in the starring role. I cannot resist but ask about it and he says he happened to be in the South Island of New Zealand when they were filming the movie and that they hired him as an extra. I don’t believe him, but he keeps such a straight face that I am beginning to waver until he suddenly laughs. What he really likes about that poster is the line that reads, “What we do in life echoes in eternity”, a quote attributed to Maximus Decimus Meridius, the gladiator portrayed in the 2000 film by Russell Crowe. He works, he says, so he can afford the boat. Williams is in his 70s now and just as busy as ever. He’s said in the past that he has no intention to retire. And he affirms it again when I press him on it: “I’ll never retire”. He seems to be having fun doing what he does and he’s been hugely successful. In 2004, he left Post Properties, a company he started in 1971 when he was just 26 and turned into a real-estate juggernaut traded on the stock market. His abrupt departure coincided time-wise with the arrival of Ranger, which he wanted built as much to win races as a comfortable cruiser for his friends and family. He could have gone sailing and never looked back. Instead, he continued creating businesses. In 2011, he started a new company with business partner Leonard Silverstein, the COO. Preferred Apartment Communities, a real-estate investment trust listed on the New York Stock Exchange, will finish the year with $2.5 billion in assets and 700 employees, or, as he says, “associates”. Among them are many long-time collaborators; people tend to stay around Williams. He is a “pillar” of his hometown of Atlanta, the commercial and transportation hub of the southeastern US, receiving the so-called Four Pillar Tribute, a local business award. His hometown business papers use words such as “legendary”, “visionary” and “a fighter” to describe him. Born into a family of modest means (he once told a business writer that “we grew poor as church mice”), he’s contributed to the growth of the city and added to its imposing skyline. He studied at Georgia Tech, Atlanta’s public institute of technology, and he has been most generous with the institutions that have helped him succeed and the community that allowed him to thrive. He made a large donation of money and time to help build the Cobb Energy Performing Arts Centre, and its 2,750-seat theatre is named after him. 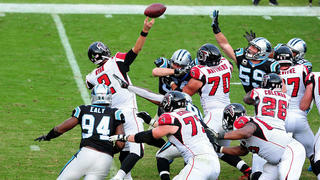 He is also part owner of the Atlanta Falcons, the hometown football team. Though he’s travelled all over the world, there is no doubt that he cherishes his heritage. 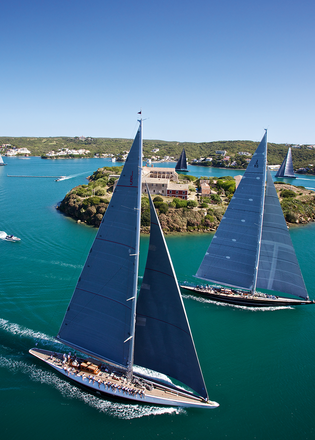 Atlanta (36.9 metres - now Genevieve) and Georgia (48.5 metres) are the names that he gave the two sailing yachts he built before Ranger, both at Kiwi yard Alloy Yachts. He laments the sharp decline of yacht building in New Zealand. He feels at home there, he says, and has entrusted Ranger’s record-setting career to a number of the country’s great sailors, including Erle Williams and Murray Jones. 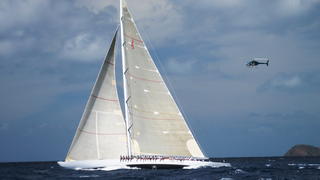 Williams contributed to enhance the now-defunct Alloy Yachts’ profile. Before the 1996 launch of Atlanta, a yacht he designed with the late Ed Dubois and Williams’ long-time go-to yacht interior designer, Glade Johnson, he says no-one believed such beautiful interiors could come out of a New Zealand yard. Boat International’s sister title, ShowBoats, he reminds me, has awarded all three of the yachts he’s built and gave an interior design award to Atlanta. Four years after Atlanta came Georgia, which at the time of her launch was the largest sloop and the first aluminium yacht to comply with both the new demanding Lloyd’s rules and coast guard regulations. A book about her construction sits on the coffee table in the reception area, along with the Ranger book and other volumes about the J Class. Abandoning the Georgia theme in his boats’ names, and a red hull colour that distinguished them, had to be for a worthwhile cause. And that cause turned out to be the new Ranger named, of course, after the 1937 America’s Cup winner. Much has been said and written about Williams’ contribution to the revival of the J Class, pioneered by Elizabeth Meyer and her resurrection of Endeavour. It was while sailing on board Endeavour, in fact, that he was inspired to follow suit. The transom of the original Ranger was displayed on Endeavour and that fired his imagination. Since he could not restore Ranger, which was long gone, he decided instead to build her anew. He would have returned to Alloy had he been able, but the J Class demanded steel, and Alloy, just as its name indicates, was dedicated to aluminium. Williams, however, is a builder and he may have another boat in him, his “last boat”. Since getting into boating years ago, he’s only had one motor yacht, the 45.72 metre TrinityVita (now Pipe Dreams), which he used mostly for hospitality during regattas. He prefers sailing and he likes to go fast, even on the road. He routinely takes his car to more than 100 miles an hour. “I always do it safely and I always do it by myself,” he says. No surprise then that he’s envisioned building an all-carbon sailer “with the goal of breaking all records currently standing”. He acknowledges that he and Comanche’s owner, Jim Clark, have had a bit of a “friendly rivalry” going on over the years. “It started with him building Hyperion, me building Georgia, and then me building Ranger and him building Hanuman,” he says. “But, you know, he is willing to spend money to push the performance levels. I think it’s good for boating and racing.” As we speak, I begin to understand that this carbon racer/cruiser is more a goal than a simple dream. He and his build team have gone as far as discussing possible yards to build her. But for the moment he is focused on the coming year of racing, especially the America’s Cup event where the Js will have their moment in the sun. 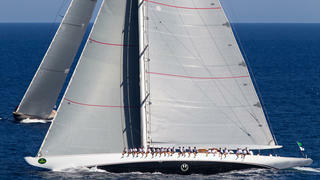 The J regatta may have as many as seven or eight of these yachts racing before the main event. For Williams, who once said how hard it might be to get four Js in one place, it’s a dream come true. “We were the first to sign up,” he says.